In order for Customer Display to function, you would require a secondary iOS device with MobiPOS Customer Display installed. You can use either an iPod, iPhone or iPad. However due to size constraint, iPad and iPhone size device will function differently. 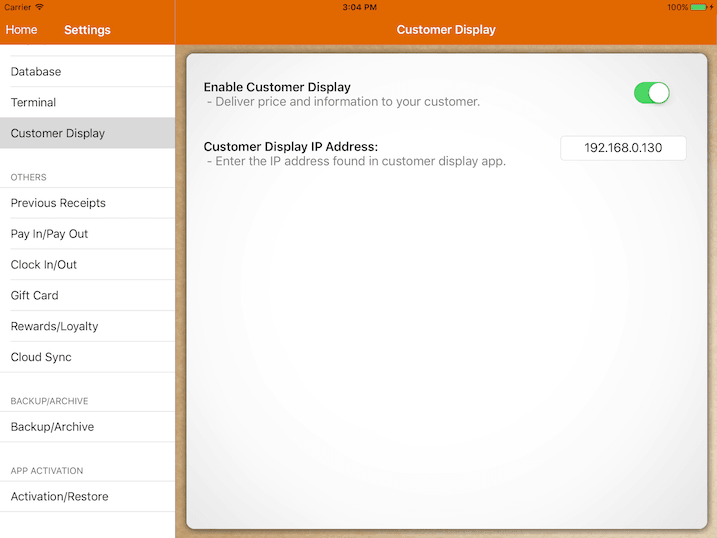 Enter the IP address found in the Customer Display app settings and turn the Enable Customer Display switch on. If setup is done correctly, start punching in order and Customer Display will work automatically. Customer Display for iPhone & iPod function very similar to the traditional customer display pole. When no bill is selected in MobiPOS, Customer Display will show a welcome message (1). 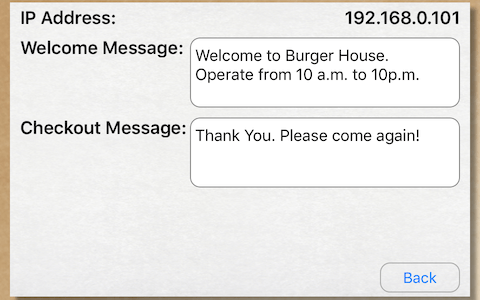 Once you start entering order, welcome message will disappear and orders with the bill total will be displayed instead (2). Upon checkout, checkout message (3) will be displayed and it will go back to welcome message automatically after a few seconds. 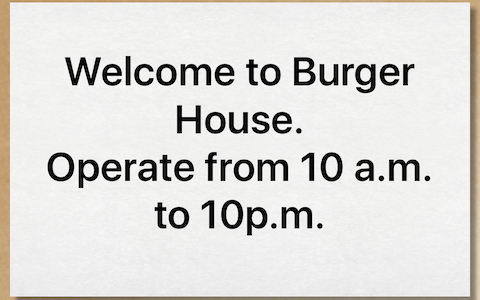 Welcome and checkout message can be configured under the app settings (4). Triple tap quickly on right top of the screen to enter app settings. Please refer to screenshots below. 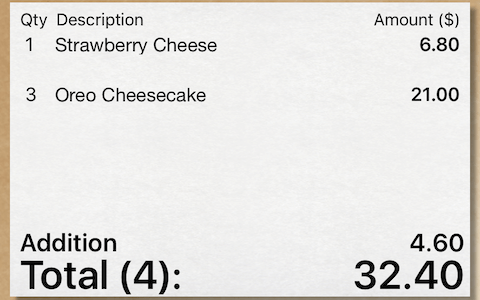 Customer Display for iPad is a mirror to the receipt you find under cash register. On the right, it is replaced with an image slideshow (1). Configure it under your Settings, import photos from your library and set the slideshow interval (2). 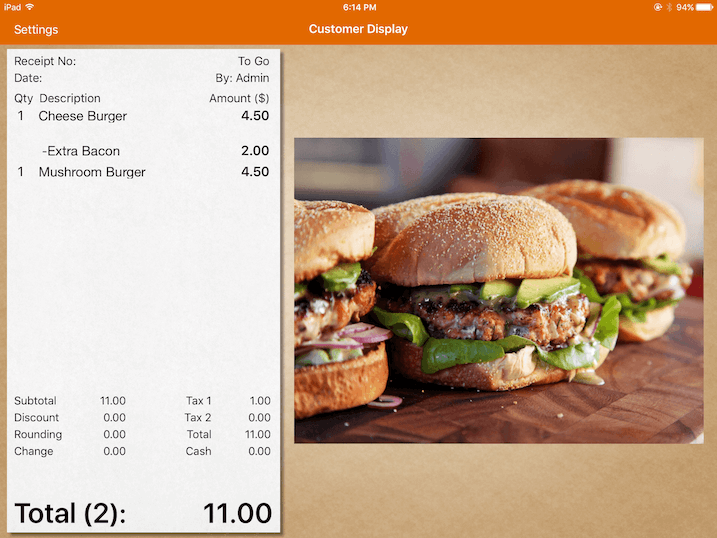 If you are using display by course or you would like your customer display to have the same theme color as main pos. You will need to synchronize with the POS. Enter your POS IP address which can be found under Settings -> Terminal, and click Sync. Customer Display retrieves images from your photo library, therefore in order to display your slides, they have to be in your device's photo library. There are many ways to import photo into your library, we recommend using iCloud or Email. If your iPad is iCloud enabled, you could use your PC/Mac, open up a web browser and enter https://www.icloud.com, enter Photos and upload the image. 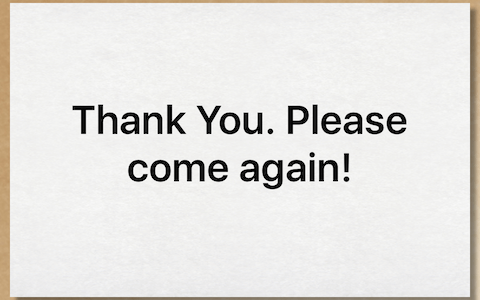 Moments later, the image you just uploaded should appear in your iPad Photo Library. If have logged in your email in the iPad Mail application, you could send an email attached with the image from your PC/Mac to the email that is associated. Once your iPad receives the email, open up the email, click and hold on the image, a pop up will display. Click Save Image. 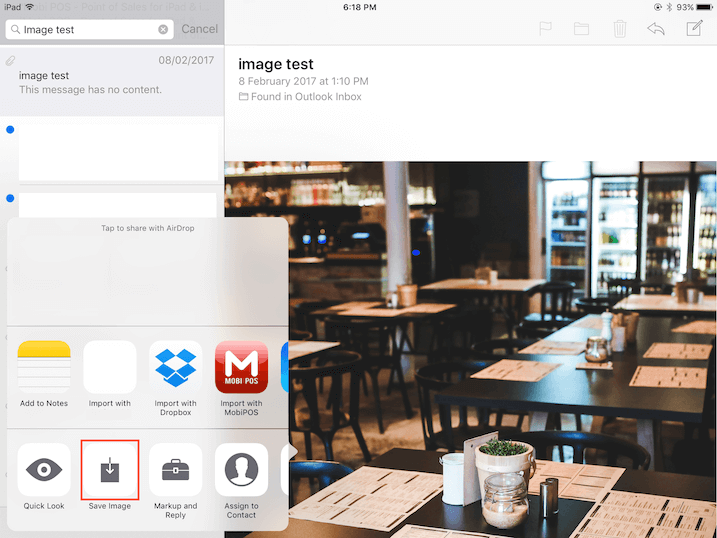 Now if your image is in your photo library, you can head back to MobiPos Customer Display and include the image in the slideshow. The maximum size for the image is 585px in width and 688px in height. For iPad with retina display, you could upload image with 1170px x 1376px in dimension.